I was being brave sitting on a log pepping the cabbie, convincing him that there are no ghosts… If one really came my way I was easy prey. For miles I had not seen anyone, just a wild monkey hopping off gleefully; thatched huts seemed separated by miles and there was not even a jalopy on the rutted roads. But if I had come that far, I was ready to go further. Danger – and ghosts – do not daunt me. Thankfully, there were tin signboards with neat arrows all along the way telling you which way and how far Pobitora was. “It’s a ghost? It is a ghost.” The cabbie screeched in the middle of nowhere. Ghost? I craned my neck out. There was not even a hint of an apparition. “Look, there……..” He pointed in exasperation. I had never seen a ghost and hopped out of the car excitedly. I squinted to blur the emerald green of the paddy fields, the banal brown of the hills and the crimson of the lotuses…I saw nothing, except the slush on my boots. The floods had washed away the roads and my fur-trimmed tanned boots were now the colour of cappuccino. I was in the middle of a jungle near Guwahati and I knew I could bump into an ultra in balaclava or a rhino in its warted portly hide. Certainly, not a ghost. The rhino looked the likeliest - I was not too far from Pobitora Wildlife Sanctuary that has the highest density of rhinos in the world. Wiping that slush off and cooling the nerves of the frazzled cabbie took a while. I was being brave sitting on a log pepping the cabbie, convincing him that there are no ghosts… If one really came my way I was easy prey. For miles I had not seen anyone, just a wild monkey hopping off gleefully; thatched huts seemed separated by miles and there was not even a jalopy on the rutted roads. But if I had come that far, I was ready to go further. Danger – and ghosts – do not daunt me. Thankfully, there were tin signboards with neat arrows all along the way telling you which way and how far Pobitora was. As I got closer I saw lazy teals in the ponds that were lorded by statuesque palms. I knew I was not too far when I heard the clamour of a settlement, of large earth movers trying hard to give the washed away roads the semblance of a road which at some places they looked like runny brown rivers…A rusted arch in green loudly proclaims Pobitora Wildlife Sanctuary and the moment you see that you know you have arrived. Mukul Tamuly, the range officer, knew I was coming and he graciously welcomed me by the gazebos that look symmetrically arranged by the man-made pond. Spread over 38.81 sq kms, Pobitora borrows its name from a Koch dynasty princess who died very young. However, its fame comes from the one-horned rhinos that migrated around 1925. As I picked facts and nibbled on the lovely breakfast that Lucky Deka had made with so much care, I wondered about the fat rhinos that weigh around 3,000 kilos. I had first seen them scrubbed and polished in a circus eating a bunch of bananas out of the hands of girls I sequined bikinis. I had never seen them in the wild. Pobitora is laden with grass, miles and miles of it. 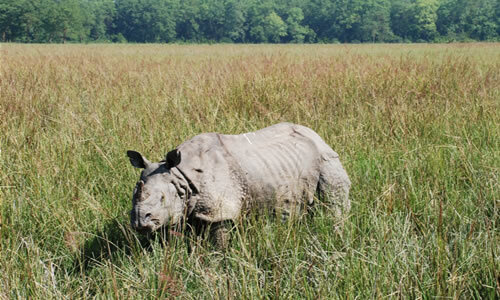 The rhinos love such grasslands, so do the wild buffaloes and boars. The mahout was telling me poaching stories and how never has a tourist gone disappointed from Pobitora - you always get to see the rhinos; not just one, two… often dozens of them in one ride. Suddenly he gestured, he could see a rhino far away. The elephant ambled on chewing tonnes of grass while walking. Minutes ticked and the rhino seemed hidden in the tall grass. “There…” the mahout pointed. I looked in that direction, I could see what looked like a lump of charcoal coloured body. And then I saw it, the one-horned rhino with warty hide. It was rising out of a pool of muddy water. Even before I could fathom the size of the fat animal, there was a quiver behind me and then a scream, “Maaro, maaro… (shoot, shoot)”. The guard was screaming. Shoot? But the rhino looked benign and it was the guard who had the rifle. “Madam maaro…” He exhorted me. Intrigued I ask him, “Kisko maroon? (Who do I kill?)”. “Photo maaro madam, photo…(shoot a picture)” the guard clarified. I obeyed, my camera shuttering frenetically. Not just the rhinos but even the wild buffaloes and boars that came our way during the one-hour ride. Pobitora had lived up to its reputation of having the largest density of rhinos in the world and the mahout kept his promise of never letting anyone go disappointed. And for one I realized that rhinos do not always come scrubbed and polished, they can look slothful and burly, benign and insouciant. I hopped off, hummed with the yellow butterflies and took the same road back to Guwahati…As I took the first mile, I thought, what if I actually saw the ghost? On second thoughts, did not seem like a bad idea!